The front door leads into into an open plan living room and dining area. The kitchen is separated by a breakfast bar. French windows lead out onto a spacious front balcony. 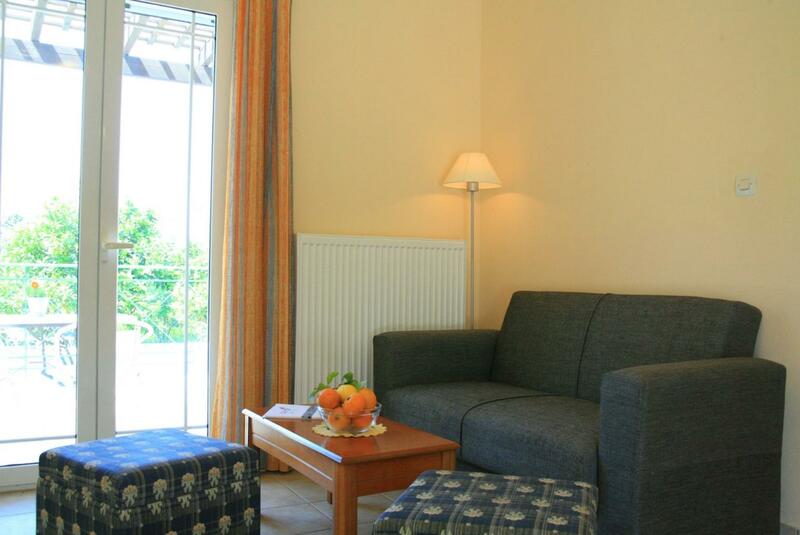 The separate double bedroom has French windows leading out to a private balcony. 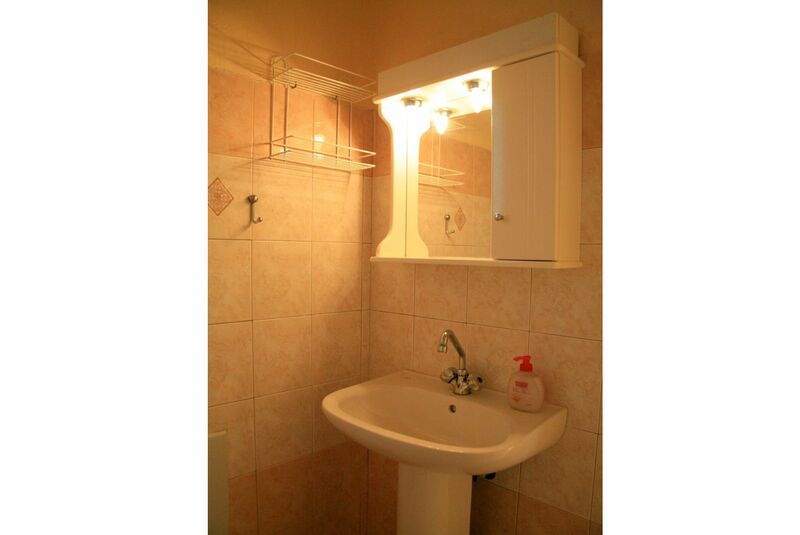 Shower room is next to the bedroom. Spacious sunbathing terraces surround the swimming pool. 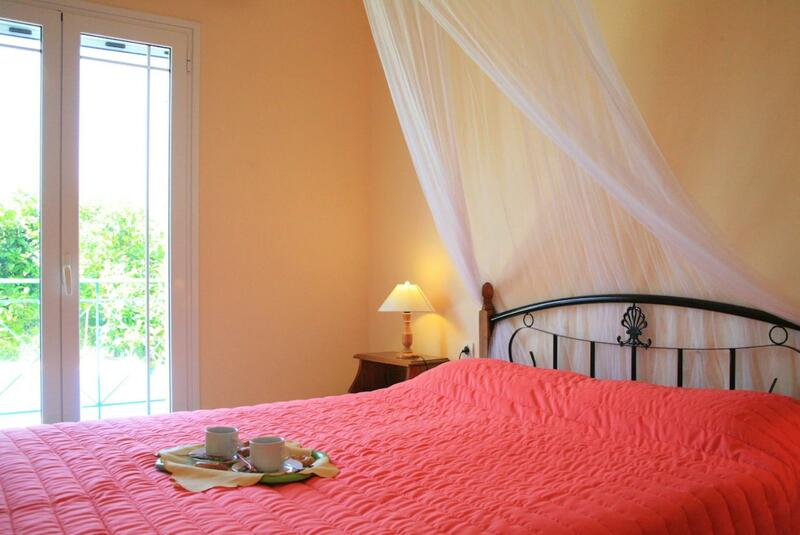 The villas on the estate are well separated with guestsâ€™ privacy in mind. 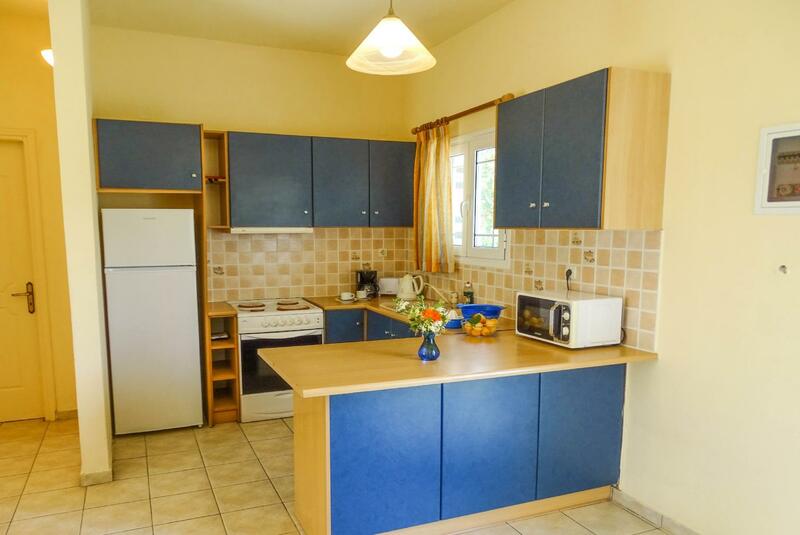 The air-conditioned kitchen features: full oven, cooking hob, fridge/freezer, microwave, washing machine and kettle. 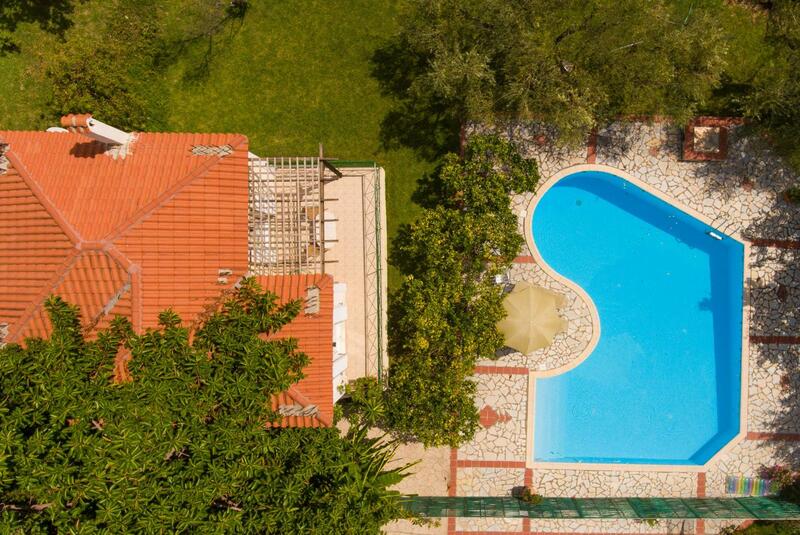 Large, unusually shaped private swimming pool. 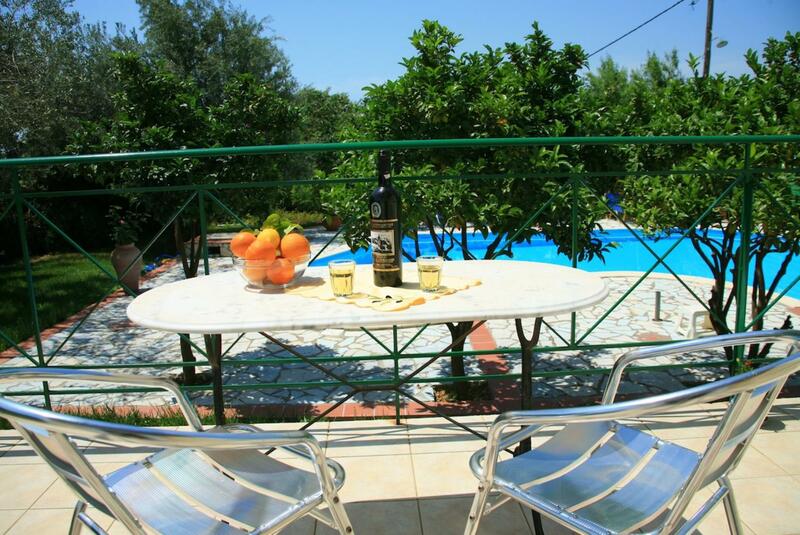 The swimming pool is surrounded by sunbathing terraces and has a mature garden to one side with flowers and fruit trees. 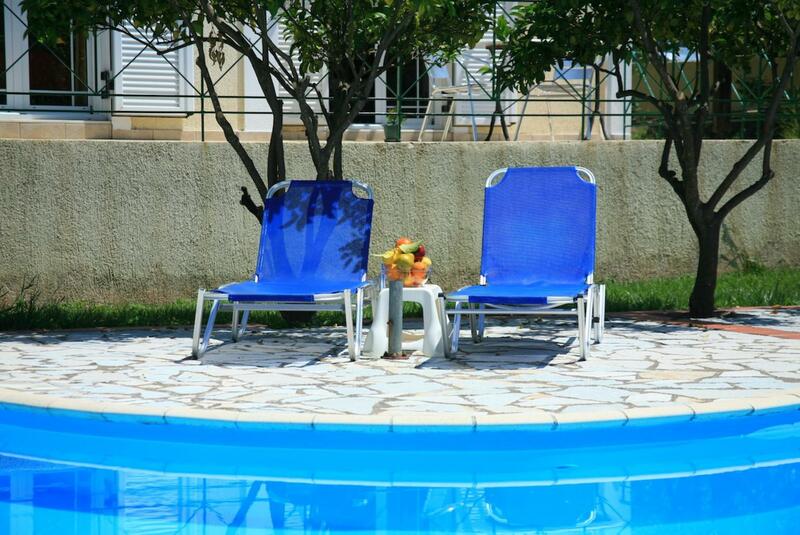 The poolside area has sunloungers and a sunshade. There is plenty of space for sunbathing as well as shady areas under the trees. Size in metres: 12.00 x 6.00 Depths: Deep end 1.80, Shallow end 0.80 metres. We had a great week at this Villa. The pool is fantastic, but the bed is hard and cost us a great deal of lost sleep. 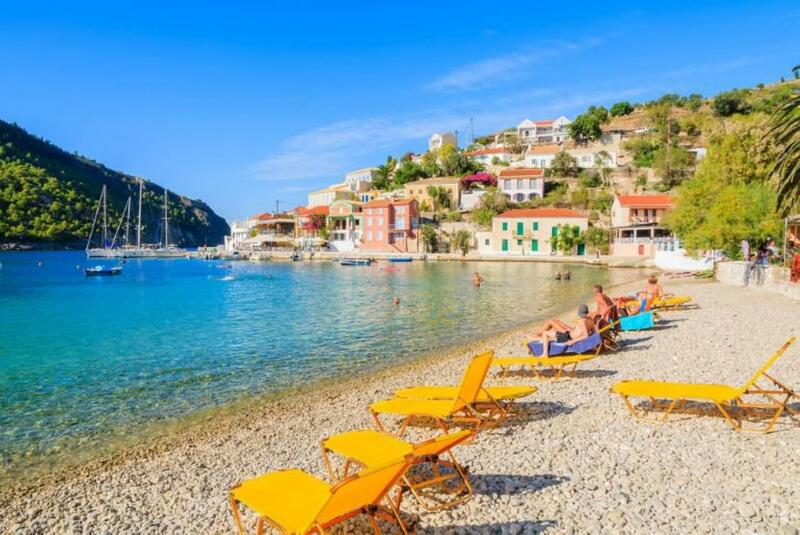 The service from Agini has been great and we would not hesitate to use you again. Thanks. 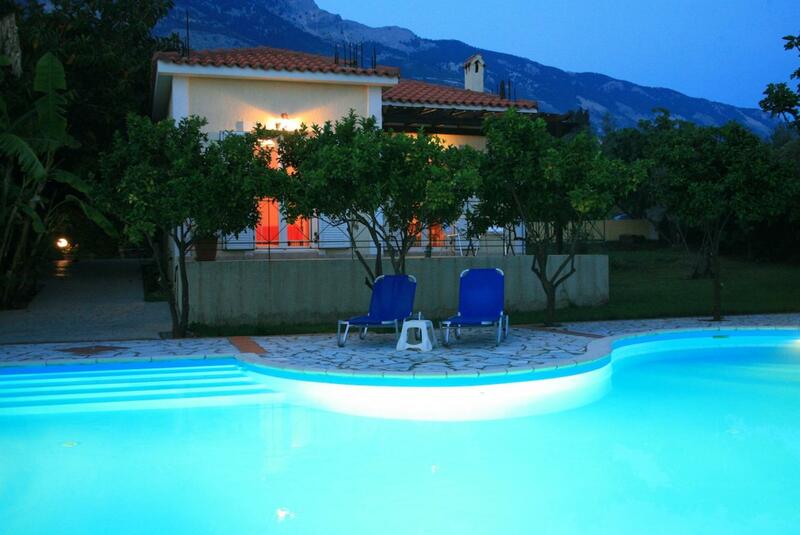 We enjoyed our stay at the Villa Russa Dionysos very much. The accommodation was good and the pool too. We were unlucky enough that a storm struck the island 4 days after our arrival which tore down the fence panels and deposited some of them, as well as lots of other debris, in the pool. The people looking after the villa were assiduous in their attempts to clear up quickly and should be commended. 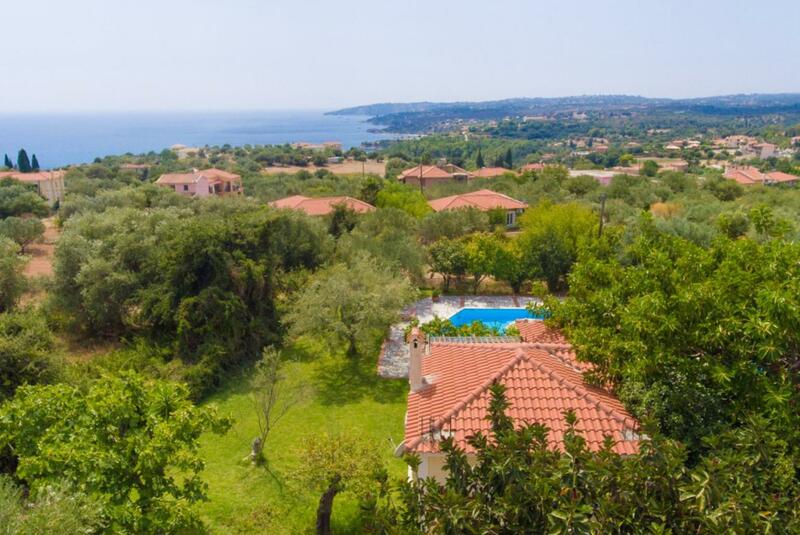 We would recommend Villa for a fit couple (steep hills in every direction) or if not fit a car would be a necessity. 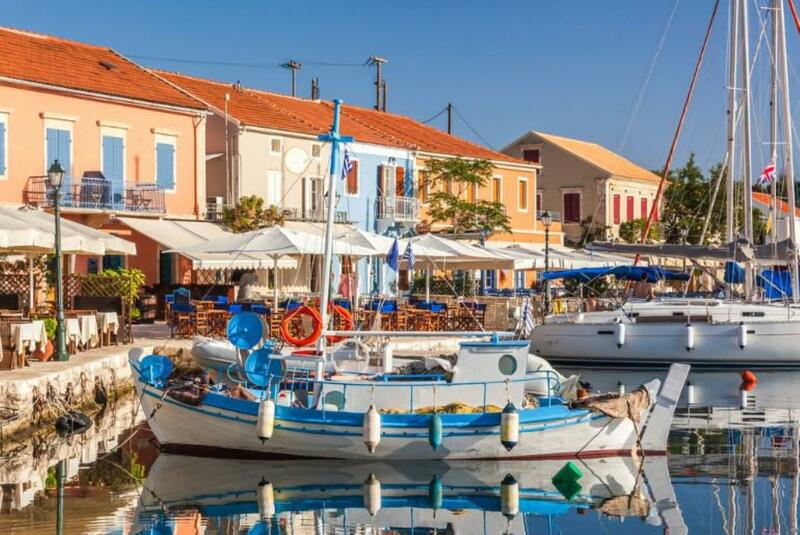 The local village of Vlachatas was really good for grocery shopping and had some excellent restaurants. 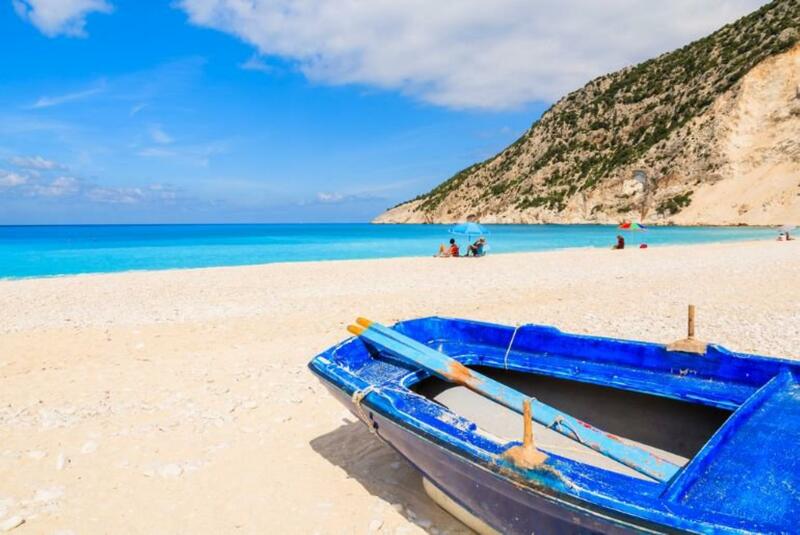 really enjoyed our stay at Vill Roussa Dionissis, loved the area & local beach. Holiday was one of the most peaceful relaxed holidays weâ€™ve had. Hubby is getting ideas of retiring there ... maybe. The views are stunning if you drive to the right places . 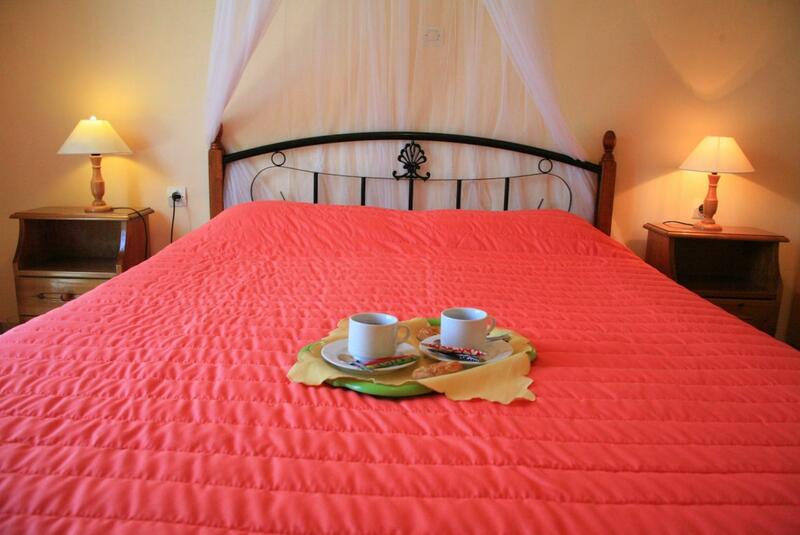 We moved into Villa Russa Dionisis for ten nights as planned after four nights in Villa Russa Anna. 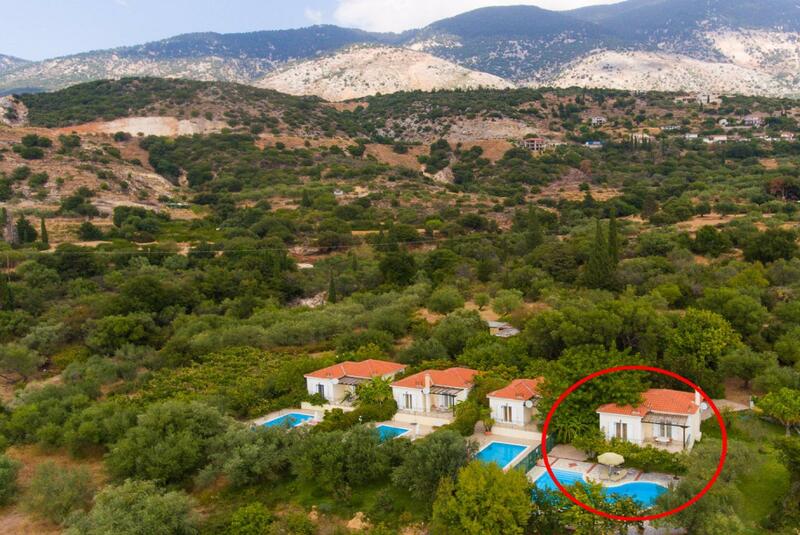 Wed stayed in Anna last year and coveted the Dionisis swimming pool........we werent disappointed! Except with the weather which meant we didnt use the pool for 3 days! However, once the storms cleared the pool and terrace came into its own with the Olive trees providing much needed shade in the afternoon. 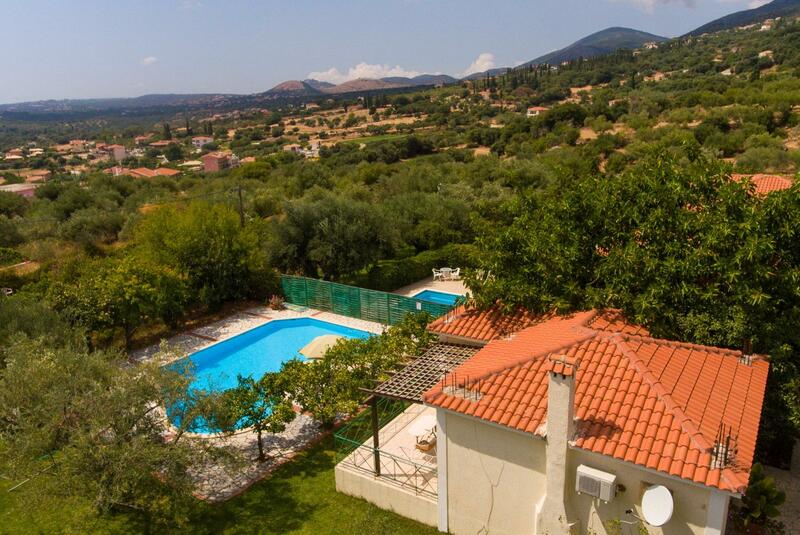 The Villa itself is a little more homely than Anna with a larger double bed (instead of the 2 singles in Anna) but the standard of cleaning, pool and garden maintenance is the same - excellent. The local supermarkets and tavernas are all good and you could manage without a car ... if you like walking and dont mind hills. It was a lovely holiday - always so impressed with Agni Travel, from the initial inquiry to the actual holiday - everything was great! Excellent time - very accurate description and pictures of villa. Couldnâ€™t have been better. Thank you. 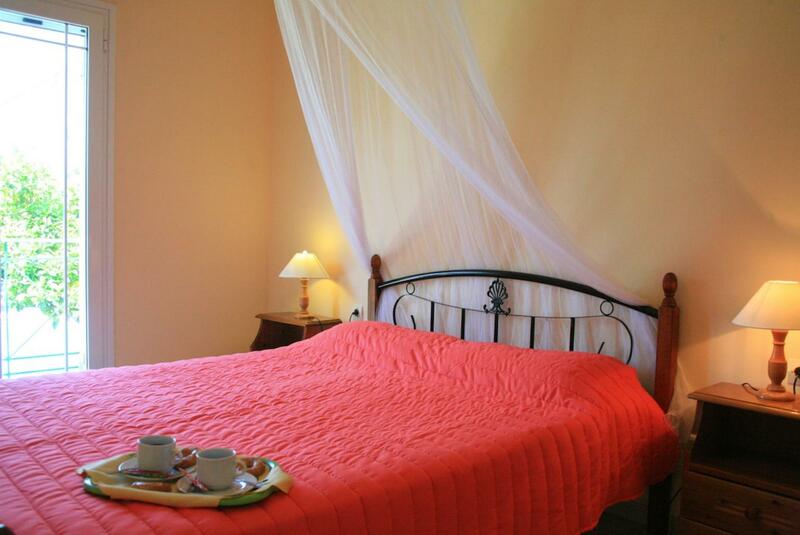 We came to stay in the villa because friends recommended it following 3 or 4 visits to the same little complex. 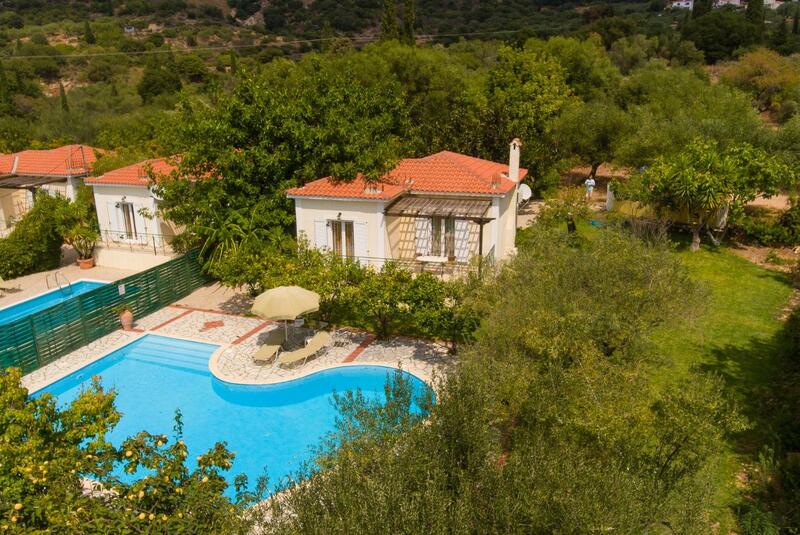 We loved Trapezaki and the villa we stayed in was perfectly situated and well kept with a fabulous pool. There are lots of lovely places to eat very close by and Trapezaki beach was fabulous for a swim. On our arrival the key was in the door, we opened it to find a lovely size living area with table and chairs near the fire place. The kitchen is fully stocked with saucepans and cutlery. Andreas and his wife are the owners they had left, sugar, coffee sachets, tea towels, washing up liquid and a toilet roll. At the end of the drive turn left walk for 15 mins up a very steep hill and shops, tavernas and restaurants are ahead of you. 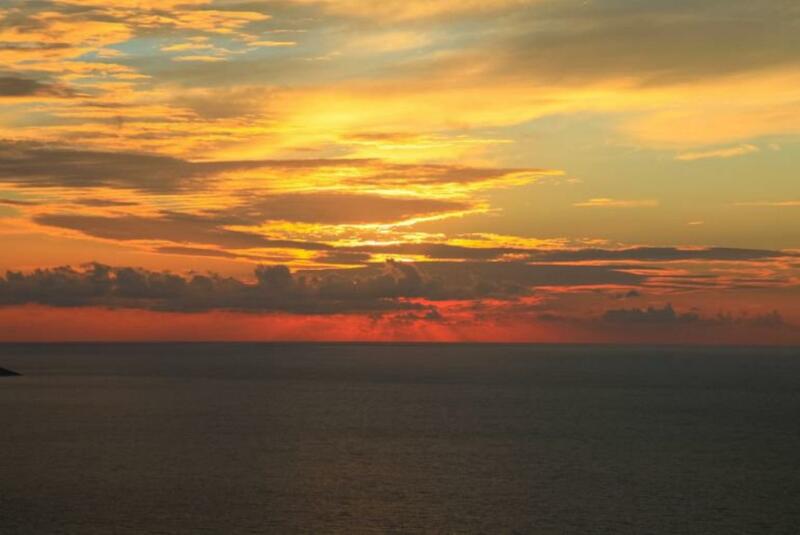 Carry on down that road and you will come to Lourdes beach. 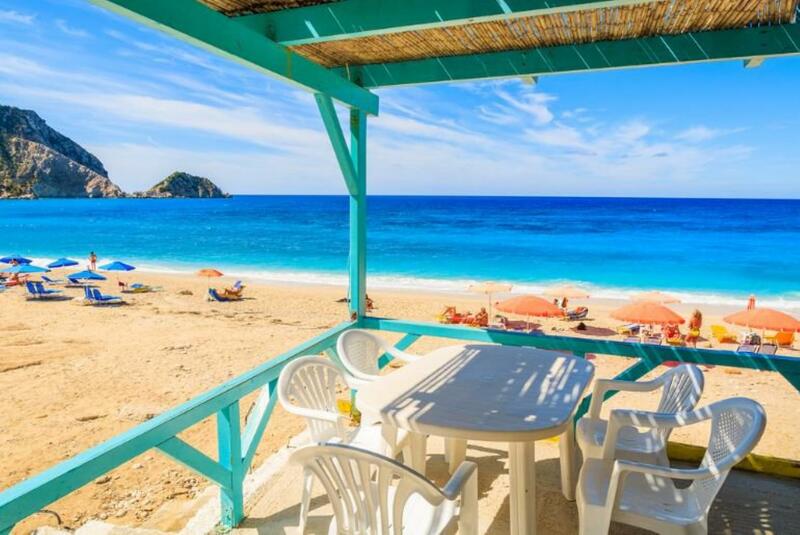 Turn right out of drive for 5 restaurants and Trapezaki beach. The pool is large and is kept clean. If you don't like walking a car is recommended. Excellent. Thanks to Andreas and Soula. Villa and garden and pool superb. 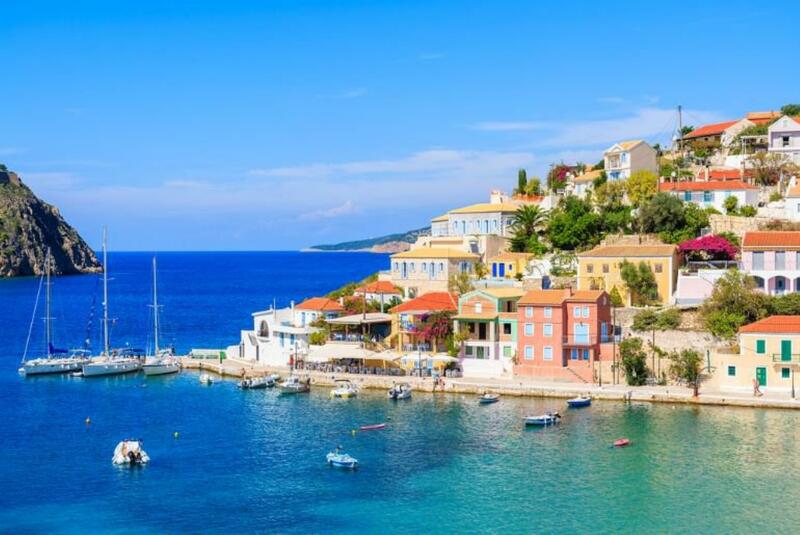 First time with Agni Travel and very pleased, excellent, friendly helpful service from all the team involved, answering any queries quickly and efficiently. 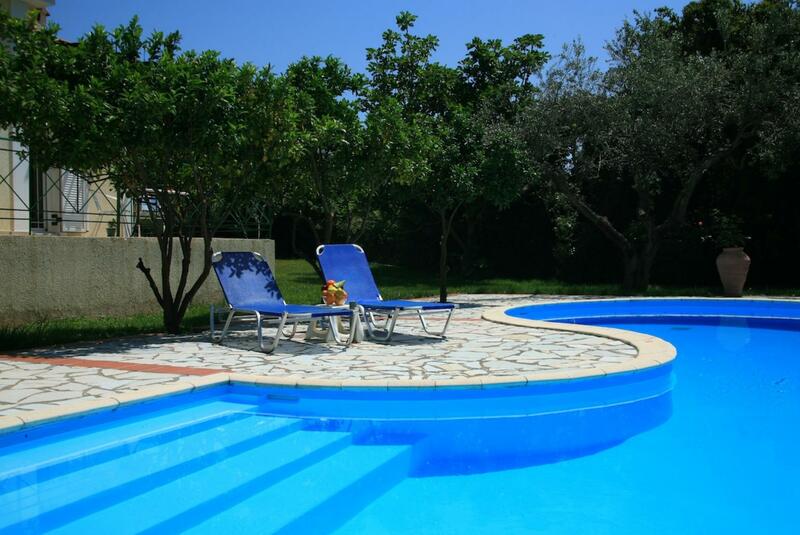 Villa Dionisis perfect beautiful pool and peaceful garden. Everybody we had contact with very friendly and helpful including local taxi drivers. Have already browsed Agni Travels website for next years holiday. Will certainly use you again. We had a very relaxing time. The gardens around the villa are very well maintained and attractive. Andreas and his wife work hard to keep all the properties pools and gardens looking good. The cleaning and removal of rubbish is better than in proprties which cost a lot more. These villas provide a simple, quiet retreat. Overall lovely. 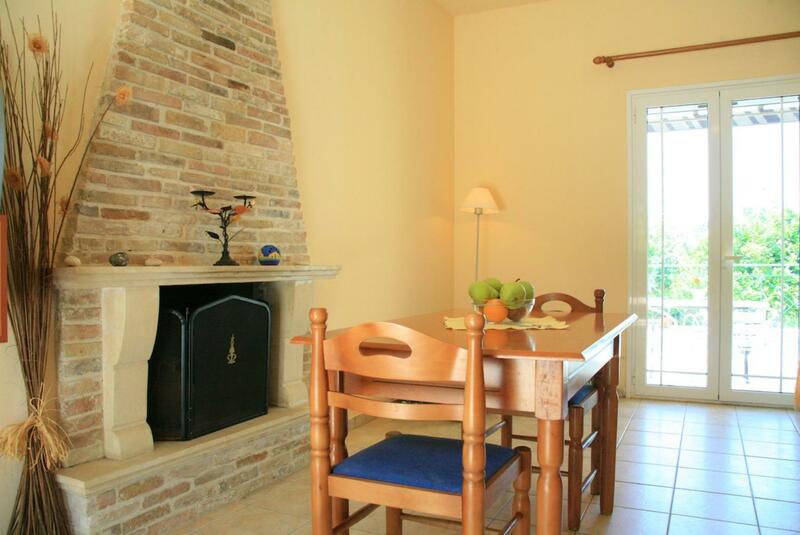 Relaxing, beautiful area, lovely little villa and would highly recommend. 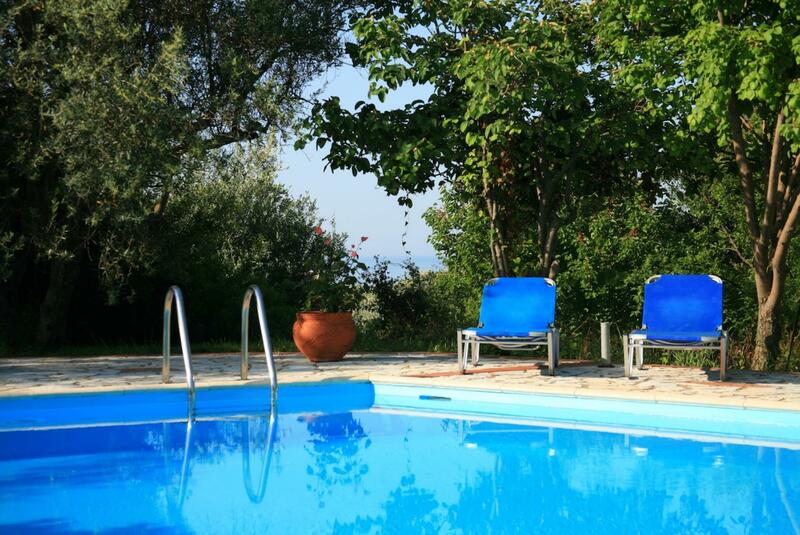 We had a fabulous stay at Villa Russa Dionisis. The villa was clean and had everything we needed (the welcome bowl of fruit and a bottle of water in the fridge was much appreciated) and the location is great - the garden is so private and peaceful with wonderful views of the olive grove beautiful flowers mountains and sea to the distance with a number of tavernas within easy walking distance and easy access to driving along the south coast of Kefalonia. A brilliant holiday all round thank you. Holiday of a lifetime....Andreas, the owner was great, lovely bloke, was helpful with anything you wanted to know about the island. 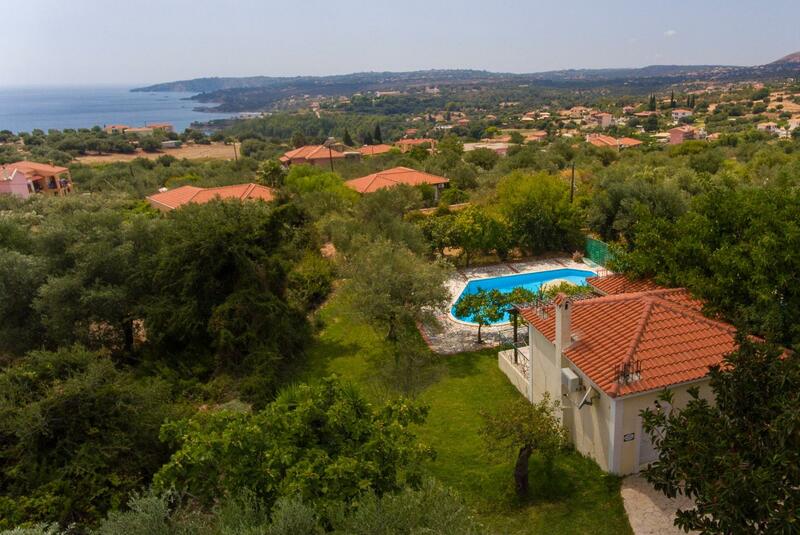 This was our 4th visit to Kefalonia and Dionisis has been one of our best villas for the location and setting. Fantastic quiet setting in the hillside. The pool was the best part - perfect and lovely gardens . Accommodation was basic but clean and suitable for purpose. 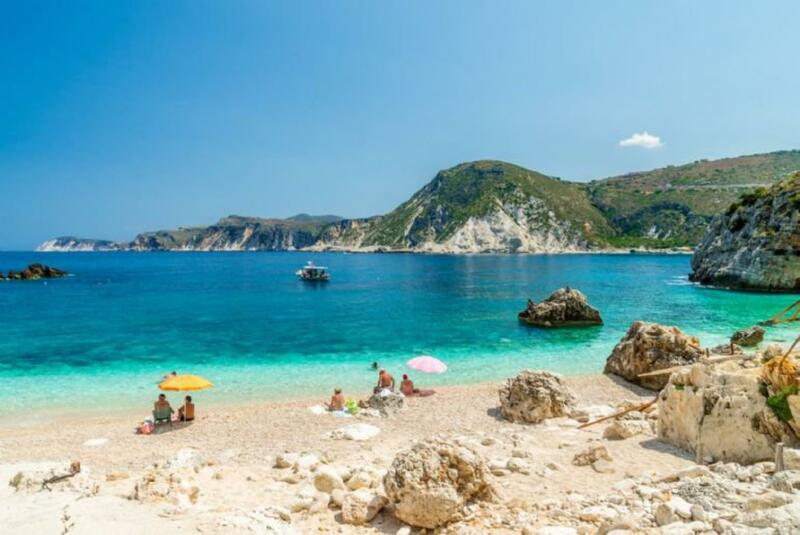 Bins were emptied every day and beddingtowels changed in the week.Improvements would be the supply of a fan for the bedroom the pergola to be covered to have some shade on the balcony and a visitors book so we could write ( and learn ) about good beaches tavernas short cuts etc. When staying a week it can take this long to find these things. It was very helpful to have been informed beforehand that a hairdryer was in the drawer. Would definitely return. The Agni Team were very helpful and responded to any queries very quickly and helped where possible. They provided lots of useful info prior to travel about the villa and location. 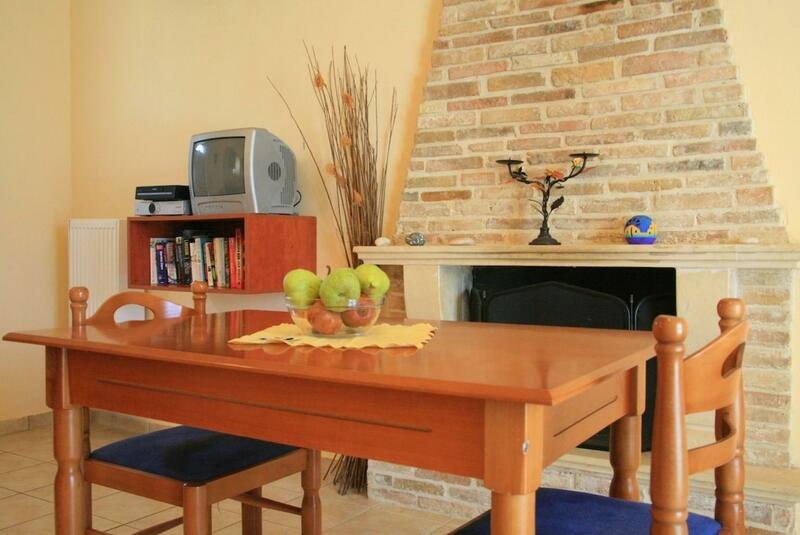 Booking the villa via the Agni website was very easy and the photos and description of the villa was accurate. The villa was comfortable with everything we needed for our holiday. When we arrived which was late in the day there was a bottle of water and some juice in the fridge and some coffee and tea so we could have a drink - this was most welcome. The villa has air con which was definitely needed during our stay. 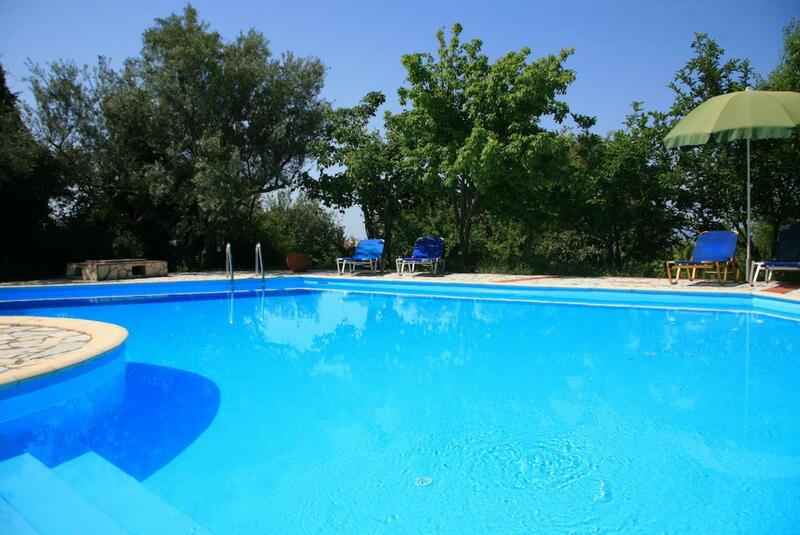 The best feature of this property is the pool and garden which are both fantastic. 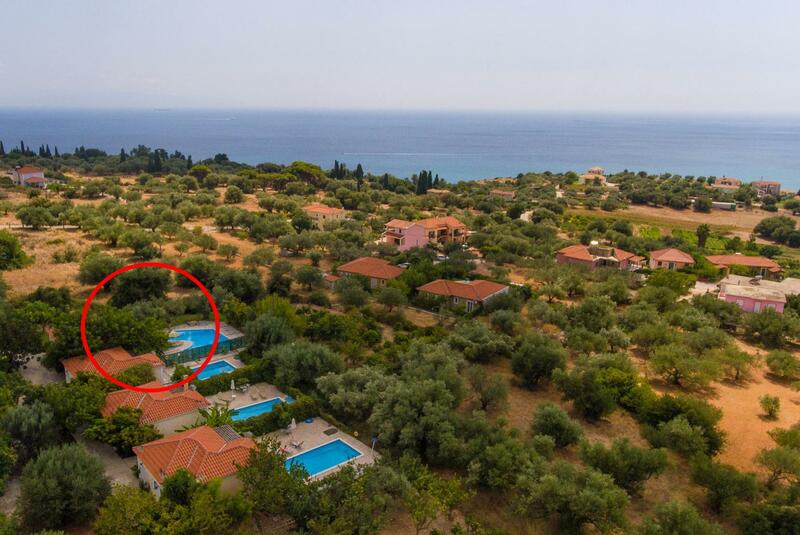 The garden is filled with fruit and olive trees and nicely secluded with a sea view. 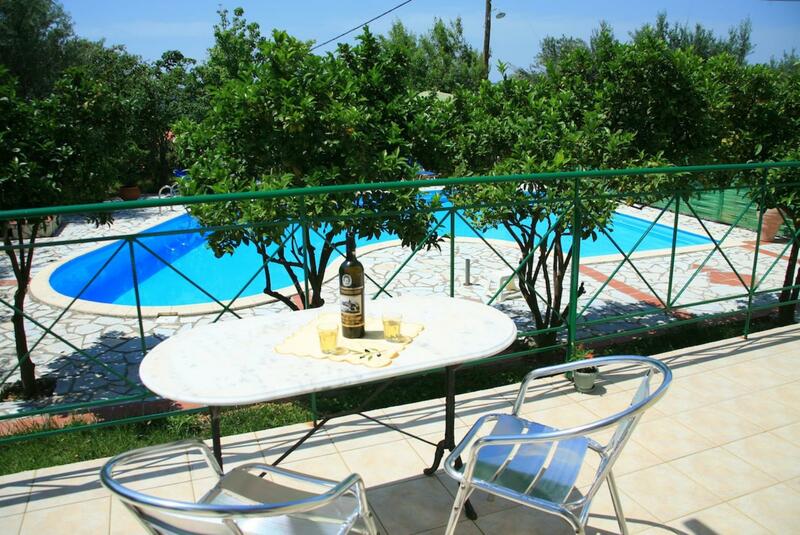 The location of the villa is very good with about 10 mins walk to the nearest bar taverna and supermarket. 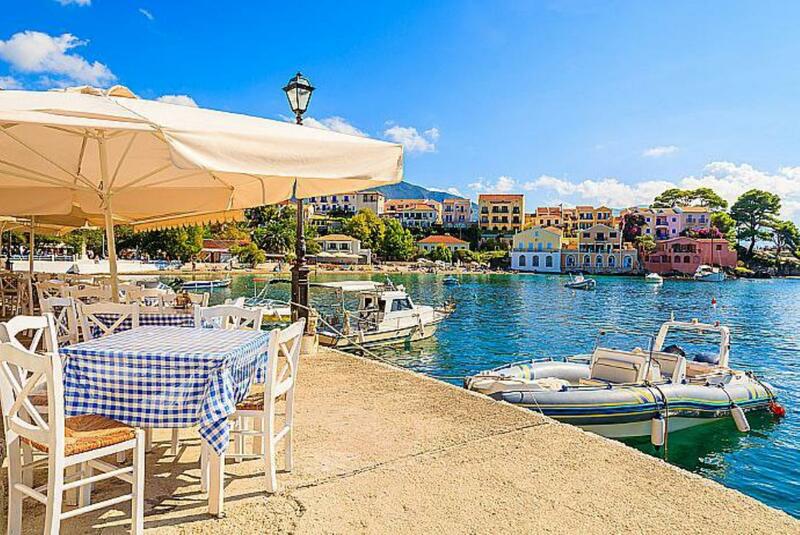 Walking a few minutes more and there are plenty of tavernas bars and shops. 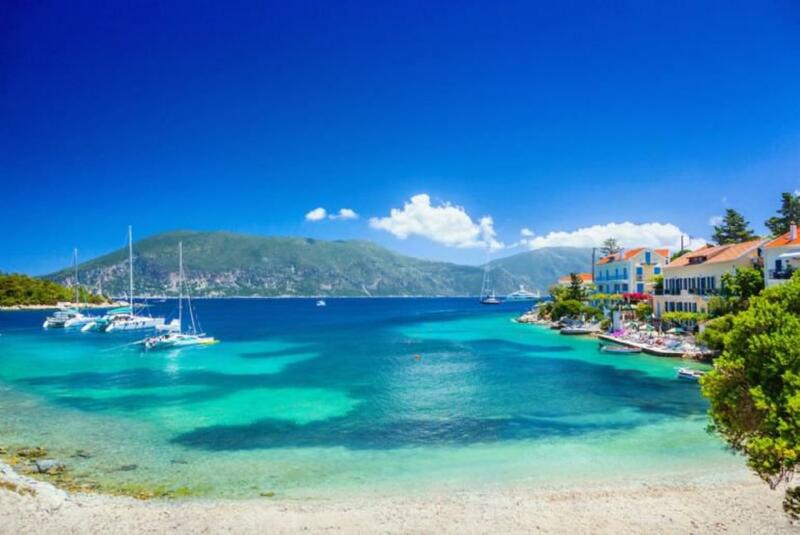 Overall an excellent base for a relaxing holiday in this beautiful area of Kefalonia. Great holiday at Russa Dionisis. 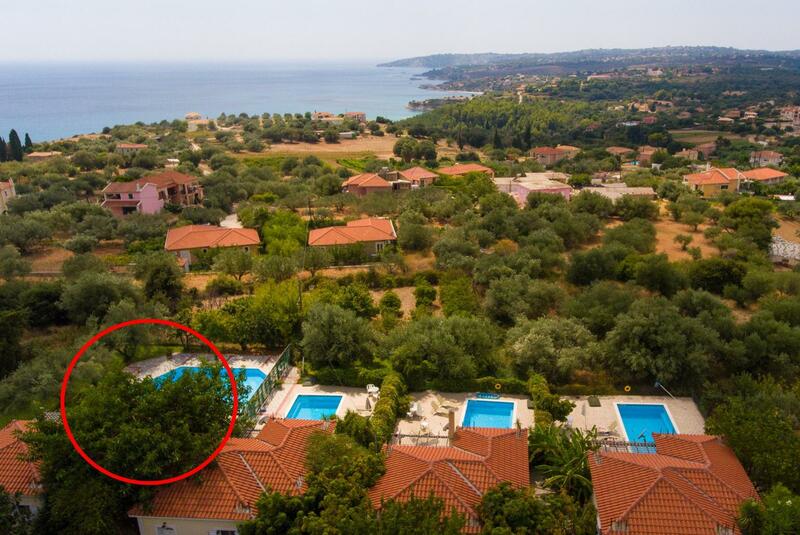 Wonderful location with partial sea view through the trees. 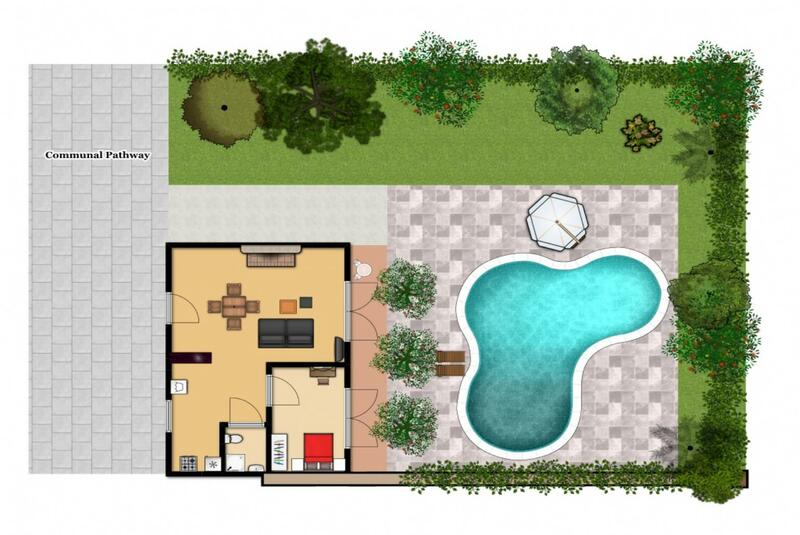 Very large pool and patio area with orange trees. 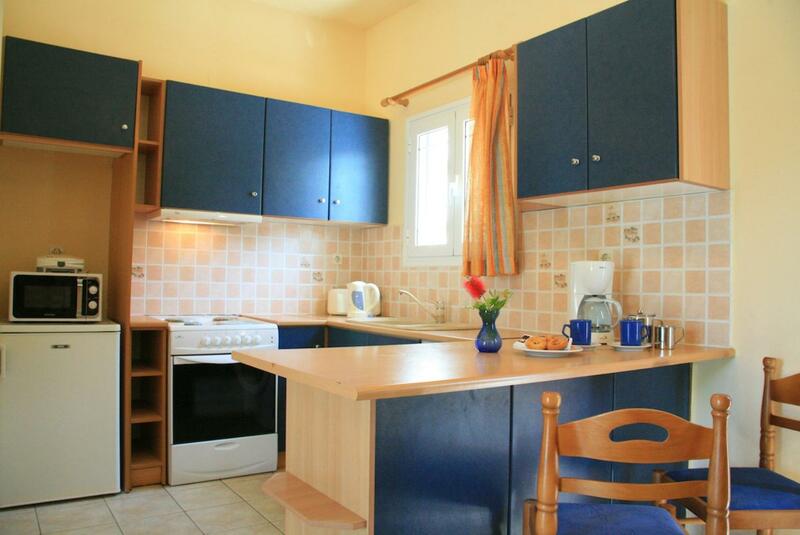 Good furnishings and plenty of cooking utensils. The villa was very clean the owner is very friendly and on hand if required. Would recommend and will be back to this villa.